File Types: PSD,AI,All Files; File Size: 57.07 MB; Requirements: Adobe CS1+; Layered: Yes; Vector: Yes. Use this pack to create your own professional logo in just a few minutes! Our newest logo creator is finally here! This time we designed a handcrafted edition: the elements appear nice and clean from a distance but when you zoom in or enlarge you can notice a subtle hand drawn shape! The pack is ideal for creating natural looking logos or if you have a business that sells fresh or hand crafted goods. There are lots of shapes inside that are fit for feminine logos too! PHOTOSHOP & ILLUSTRATOR - All the logo elements are vectors that you can use in either Illustrator or Photoshop so you can scale them to any size you wish. Combining elements is very simple and fun. - 32 Font combinations using free fonts, links inside the package (AI & PSD) Features. - Files in both PSD & AI for Photoshop and Illustrator EXTENDED LICENSE INCLUDED - Create any number of designs and sell them where you want! IMPORTANT! The download links for the fonts used in the text combinations are included in a text document inside the package. Please take the time to read the instructions in this file. Have fun creating your own logos! 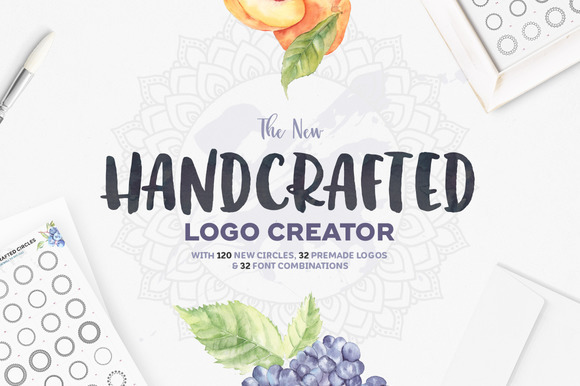 Keywords: logo, creator, creation, minimal, vintage, feminine, women, circles, badges, ribbons, label, hand, drawn, set, bundle, mandala, badge, simple, floral, mandalas, foil, golden, silver, glitter, design, logos, massive, premade, kit, wedding, professional, handcrafted, handmade, logo creator.